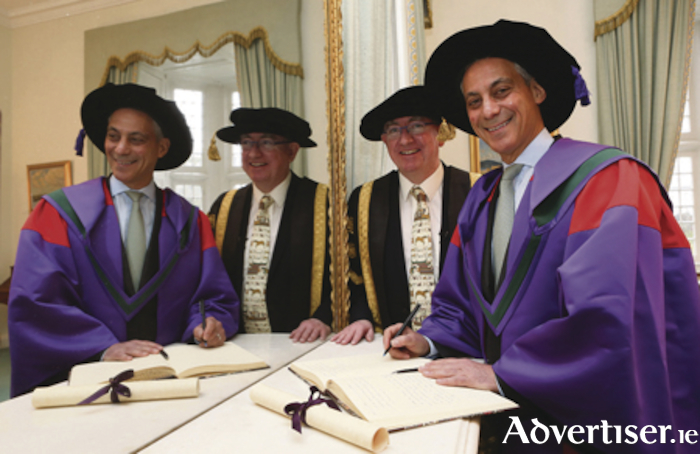 Mayor of Chicago Rahm Emanuel conferred with Doctor of Laws Degree (honoris causa) at NUI Galway. Photo: Aengus McMahon. The Mayor of Chicago and former White House Chief of Staff in the Obama administration, Rahm Emanuel, enjoyed Galway's hospitality this week. Conferrred on Tuesday with an Honorary Degree of Doctor of Laws (honoris causa ) at NUI Galway, Rahm Emanuel is the 55th mayor of Chicago. Before becoming mayor, he was the White House Chief of Staff in the Obama administration, serving served three terms in the US House of Representatives representing Chicago’s fifth District. He was also a member of the Clinton White House from 1993 to 1998, rising to senior adviser to the president for policy and strategy. He graduated from Sarah Lawrence College in 1981 and received a master’s degree in speech and communication from Northwestern University. Among his accolades in his home city, Mayor Emanuel has led the passage of budgets containing reforms and investments to solidify Chicago’s financial future; enacted education reforms including lengthening the school day and year; created universal full-day kindergarten; and made Chicago the first big city in the country to offer free community college to all high school students who graduate with at least a B average. Page generated in 0.1783 seconds.